Angkor Wat, Mt. Rushmore, and the Taj Mahal are places so famous that the cities that fall under their shadow are usually left out of the story or, at least, often go underlooked. They’re global must-sees, where steady streams of tour buses with sleepy checklist tourists pull up to their ticket offices, disgorge their content, and await their wards to return a few hours later with both their bellies and memory cards full. In southern Spain, the Alhambra is another see-before-you-die kind of place, attracting those same ant streams of tour buses and their accompanying souvenir shops. And it casts a literal shadow across an arid Andalucian valley onto the city it was built to protect. 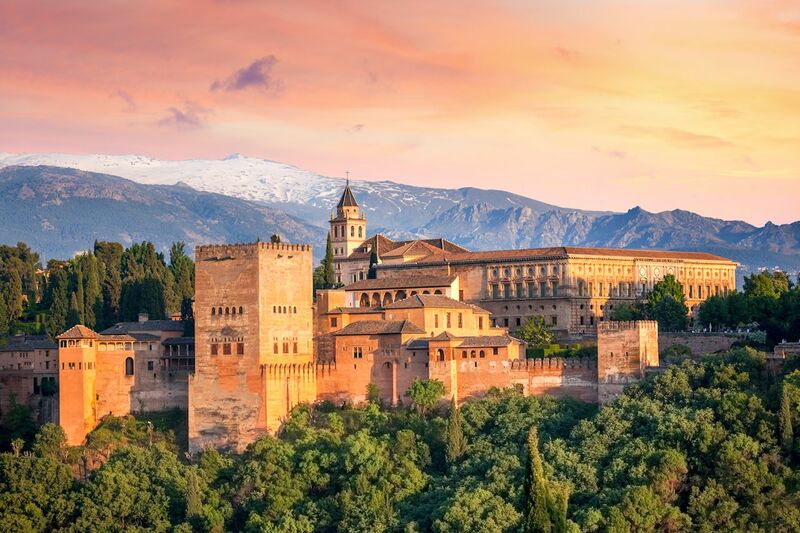 But unlike those other places, the city that lies under the watch of the “red fort,” as alhambra translates from Arabic, is a wonder on its own. Granada is a living, breathing lesson in looking beyond checklists and discovering the pulse of what drives the people who live there today. That said, it’s a lesson that isn’t easy to learn. The reddish castle crowning the hill of Sabika is almost impossible to ignore. Perched atop a fold between valleys cut by the Darro and Genil rivers, it serves as a constant visual reminder that it’s going to be the first thing you’ll be asked about when you get back home. It appears when you least expect it and then, just as unexpectedly, disappears between the narrow streets, reminding you that you still haven’t booked your ticket to the palace online. The thing is, this is a city that demands your attention. It’s a city with a voice that is completely its own in a country dripping with tourist superlatives. A city with its own vocabulary and accent that has somehow managed to retain most of its duende, or passion, and the greater part of its soul amidst the millions of tourists that check the stop at the top of the hill off their lists every year. A place that has been welcoming people from all over the world since long before the great 14th-century traveler, Ibn Battuta, ran across aesthetes from such far off lands as Samarkand, Tabriz, Khorasan, and India who had made their home here. To this day, it’s a community that continues to elegantly yet resolutely preserve its distinctness. It’s a town whose people are generous to a fault and know how to get on with things without wasting time looking back. Little wonder this area has always drawn travelers to it. A patchwork of different white and green hues dresses the skirts of the soaring Sierra Nevada mountains, which rise up from the flood plain below and climb up to the highest peaks in all of Spain. In just under an hour away, you can be skiing in those same mountains. Those mountains also conveniently provide the Alhambra with a snow-capped picture frame for photos taken from across the valley in the Albaycin neighborhood. And if the slopes aren’t your thing, head an hour south and find yourself on the Costa Tropical among mangoes, avocado trees, and sugar cane, all made possible by the year-round warm breeze that blows up from Africa and across the Mediterranean Sea. 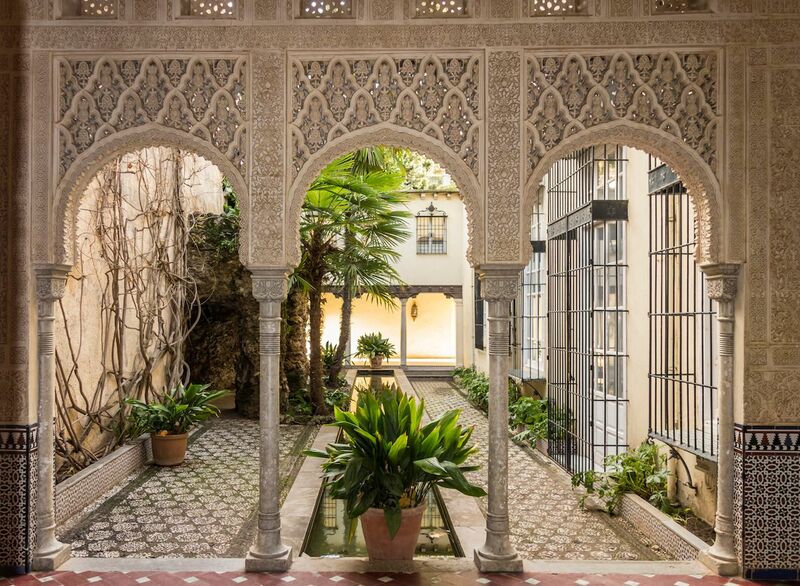 Granada is a city of secret and not-so-secret walled-in gardens, or carmenes as they are known here, that have been an integral part of life here since the days of the Islamic Nasarid dynasty and the Emirate of Granada. Today, re-creations of these calming oases of running water, lush green palms, and fruit trees provide much-needed shade during the punishing heat of the summer. From the Carmen de la Victoria observation deck, you can take a break from your in-depth explorations of the Albaycin neighborhood and once again be reminded of the daunting castle, or get another perspective from the other side from the Carmen de los Martires palace, or garden of the martyrs. As the melancholy name suggests, a complicated history persists in the place that was, in the late 15th century, the last toehold of the Muslim world in Western Europe. 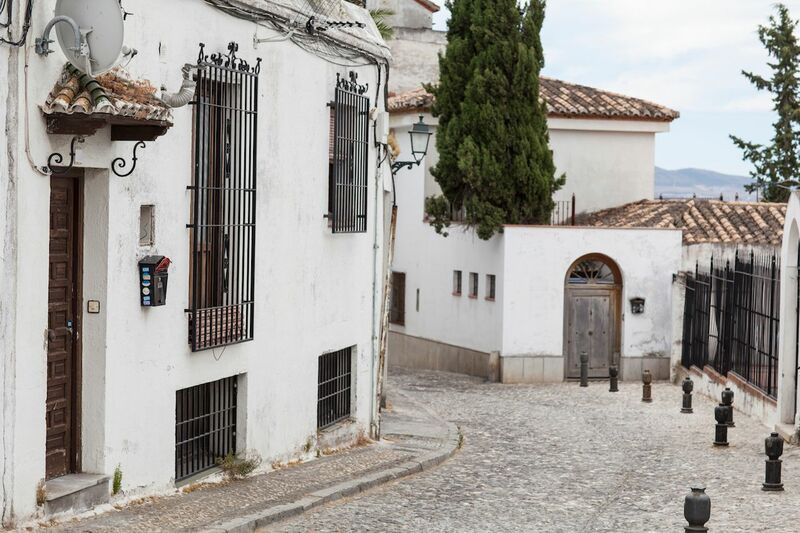 This city is also one of twisting lanes, pre-dating the automobile, like those of the Alcaiceria that wrap themselves around the Granada Cathedral. Lanes that seemingly always snake their way uphill and which gently persuade the visitor to explore the city on foot, thereby making each discovery that much more rewarding. But keep your wits about you as you wander and beware of the suicidal scooters that can suddenly appear, noisily hurling themselves down the narrowest of places, risking their lives and everyone else’s in the process. As a result of this gentle persuasion and the occasional need for a drink, it’s also a city that is best understood through its tapas bars. 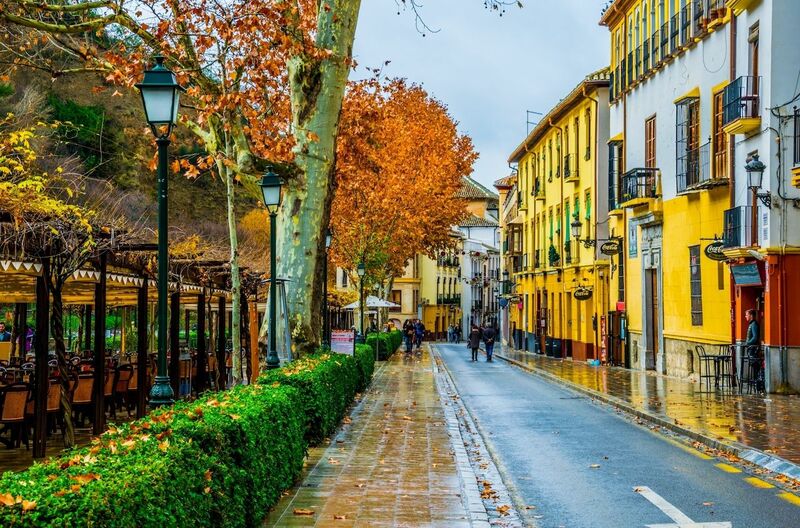 Spain may be famous for its tapas but once again, Granada insists on being itself, indelibly putting its own stamp on this most civilized Spanish custom. Here the emphasis is on conversation, with the drinks and food being secondary. It doesn’t matter if you’ve ordered a beer, wine, soft drink, juice or coffee, what is important is the here and now and what your friend has to tell you. After one or two drinks, a change of scenery to fuel the conversation is the thing to do and locals hop from bar to bar. 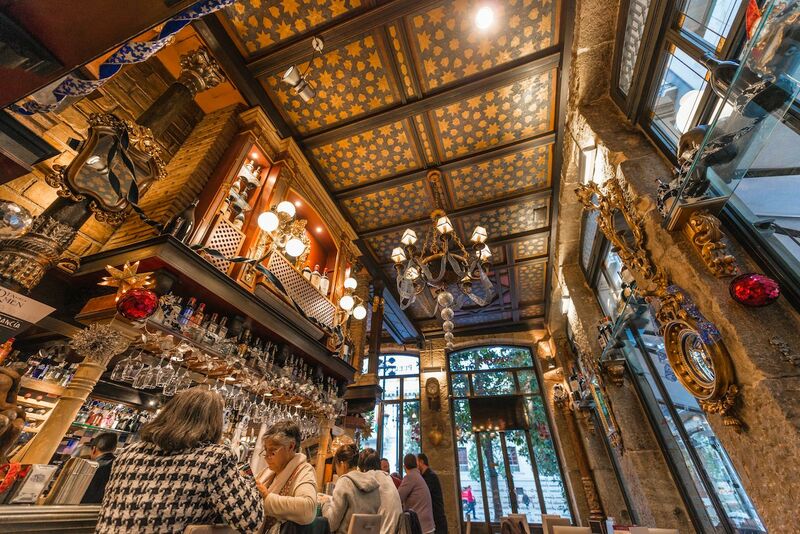 Whether you head to the more touristic zones like the Plaza Nueva; classic areas like El Realejo, the Calle de la Elvira, and the Calle Navas; or the more student-friendly locales of the Plaza de Toros, El Zaidin, or La Chana, just step into a bar and watch the magic unfold. Order your first round and the bartender will shout something like, “Two firsts!” And before you know it, a much-larger-than-normal tapa will be laid down in front of you. You might ask yourself, “Did I order that?” But this is the key concept to tapas in Granada: They come free with your drinks. Each round corresponds to a different dish, and each bar specializes in something different (snails anyone?) in an attempt to outdo the competition, and the competition can indeed be fierce. It’s around these wonderful plates of conversation fuel that today’s Granada revolves, and it’s here where the true social soul of today’s city can be found. The palace on the hill might have originally brought you here, but there is something so enticing, so alluring about the unexpected and the unknown that the Alhambra can wait until you really get a better feel for the place. After all, you can always buy your tickets after you discover which delicious dish comes with the fourth round.